The purpose of this description is to detail the methods needed to properly install a parachute into your new Wills Wing Covert harness. Use the following description as a guide but if there are any questions regarding difficulty or specifics not covered below, please feel free to email me at Shapiro@www.willswing.com. 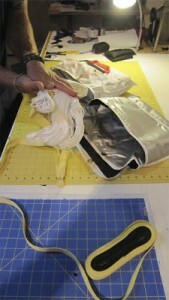 Your new harness comes with a deployment bag(s) that is specific to the deployment system designed for the Covert. 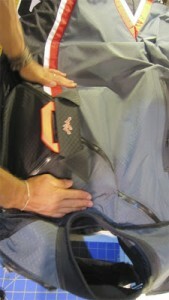 It is a LARA style bag with an embroidered “paddle” sewn to the handle of the bag. 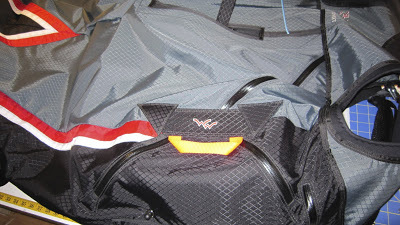 Although your Covert comes with a LARA style bag, it can successfully be used with most if not all of the common chutes used for the sport of Hang Gliding. 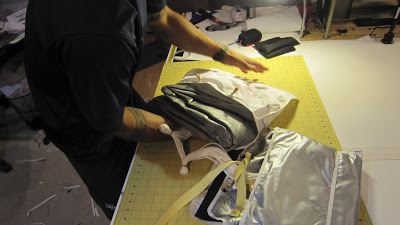 The first step toward installing your chute properly is to remove the Covert deployment bag from your new harness and to transfer your parachute into that Covert specific D-bag. This is made easier by laying your Covert with the inside of the harness facing down and the harness opened up so the chute handles are facing the ceiling. The harness should be in this position during the entire installation process as this position allows for the outer shell material to be very loose and easy to manipulate (see photo below). Now, to pull the d-bag out of the harness, you first pull the handle and paddle away from the main harness body, separating the Velcro and clearing the paddle from it’s two triangular shaped captures. 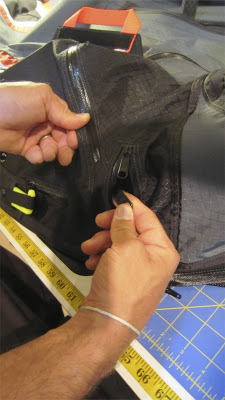 Next, use your fingers to separate the (3) zippers that close bombay doors to expose the area where your chute will eventually be installed. Finish by pulling free the Covert d-bag. Set it aside. 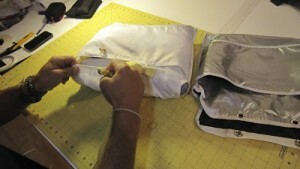 The next steps involve transferring your parachute into the Covert D-bag. Below is a series of photos documenting the process. It’s helpful to have 4 spare rubber bands on hand for the transfer process. 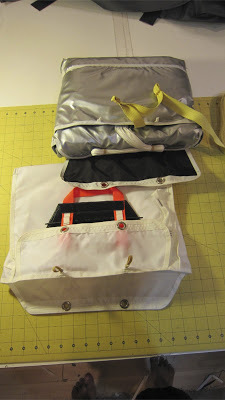 The canopy of your parachute should be accordion in a width to fit by filling out the main compartment of the Covert D-bag as proportionately as possible. If done properly, the chute should be as flat and as wide as the bag allows. Start by removing the bridle from the rubber bands on the old D-bag. Replace with two of your spare rubber bands. This will begin to open your current D-bag allowing access to your canopy and shrouds. Next, remove the first shroud “butterfly” from their two rubber bands and replace with two of the free rubber bands you have on hand. This keeps the shrouds organized and makes it easier during the re-installation process. 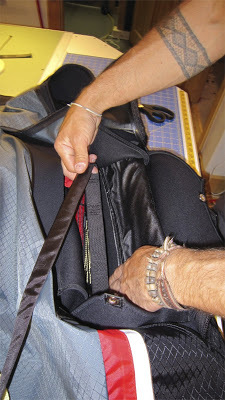 Now you have access to remove your canopy from the old d-bag’s main container and carefully place it back in to the main compartment on the LARA style COVERT D-bag. Next, remove the shroud bundle and swivel from the old D-bag and replace in the corresponding shroud pocket in the COVERT D-bag. Then, take the butterfly’d shrouds and secure the first cover flap by reattaching them to the bag with the rubber bands on the COVERT D-bag. Then, close the main closure flap by pulling the last two rubber bands through the grommets and securing the first fold of the bridle. Remember to remove the spare rubber bands that you placed to keep things organized during the transfer. 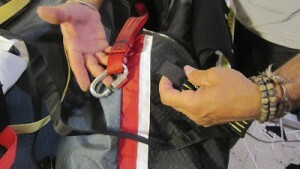 Now that you have your parachute transferred into the COVERT D-bag, you can begin securing the Parachute into the harness. The first step is to connect the chute to the harness structure by using an appropriate link to connect your chute’s bridle to the red “screamer”, or load limiter, that is securely sewn inside your new harness (behind your shoulders). With the chute door zippers open, reach up to the screamer connection and make sure, as it runs into the area where your chute will be stored, that it’s laying as flat as possible. Connect to your bridle with a 8mm Raptide link (or your preferred type of connection) to the 1” loop at the end of the screamer. Next, lay the screamer, with the bridle properly connected, inside the recessed section of the chute storage area (see photo). 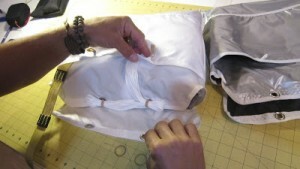 Organize your chute’s bridle by “butterfly” folding the bridle to fit inside that same recessed area. The goal is to make sure your bridle lies as flat as possible under your chute, and is organized so that in the event of a deployment, the bridle will follow the D-bag out without tangle. When the entire bridle is stored properly in the recessed area within the chute storage space, lay the parachute (in it’s Covert Deployment bag) on top of the bridle and in between the neoprene flaps that will secure your chute. Make sure the handle and deployment “paddle” are facing up and in the correct orientation (see photo). 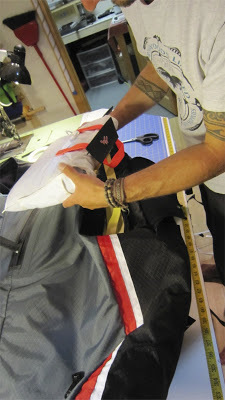 To begin the process of securing the neoprene flaps around your parachute, take a length of string or thin cord, approximately 24” long, and thread one end through one of the bungy loops sewn into the rear neoprene flap. 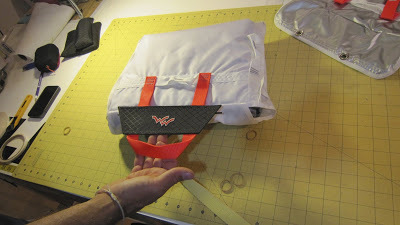 Even up the ends and then thread both ends through its corresponding side flap grommet and then through the same side grommet on the front neoprene flap (see photo). Repeat this process with the opposite bungy to have both strings exit the grommets on their perspective sides. Next, thread each of the strings through the grommets to exit the outer shell of the harness and tie the strings together loosely on the outside of the harness to secure them for the remaining steps of the chute installation (see photo below). Your next job is to zip up the harness chute doors. There are two #10 zipper gliders included with your Covert. You can find them in the top pocket of your harness bag. Take one of these zipper gliders and start by zipping up the door zipper that point toward your hip (if wearing the harness). Note: Make sure the paddle and chute handle are outside of the harness when the doors get zipped. 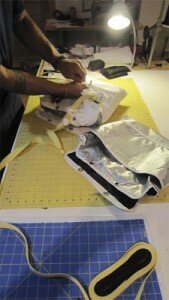 Start at the handle side of the zipper. 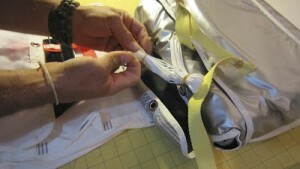 With the zipper glider facing down (or, inside the harness) thread the glider onto the zipper. Be patient and take the time necessary to line up the angle of the zipper so that it matches (see photo). 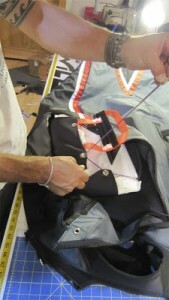 If they are not aligned, there will be a wrinkle or pleat in the harness shell. 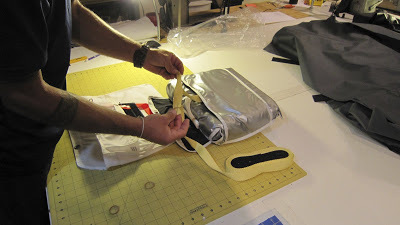 Once aligned, zip the glider all of the way down the zipper, under the neoprene “hood” and off the end of the zipper. You can reach inside the shell to remove the zipper glider off of the end of the zipper. Next, repeat this process on the zipper that closes toward the center of your back. 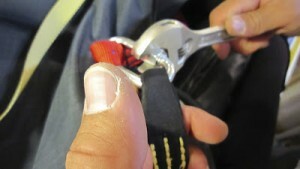 The best way to reach in to pull off the glider from the end of that zipper is to reach inside the harness through the main riser slot (behind your main). Next, repeat again with the zipper that closes toward the aero tow loop access zipper. 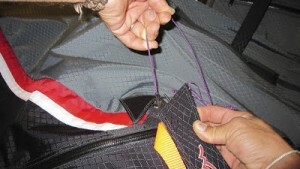 You complete the process by pulling the zipper glider off the end of that zipper through the aero tow loop access. Now, all of the chute door zippers are properly closed and your handle and deployment paddle are outside of the harness, along with the strings exiting the grommets on either side of the handle. One at a time, pull the string with enough force to see the bungy stretched outside of the exit grommet. 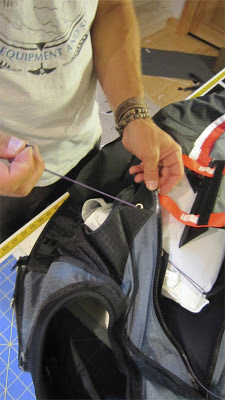 With the bungy loop pulled out of the harness, thread the nylon rod (sewn to the handle “paddle”) through the bungy loop to secure the neoprene flaps inside the harness. 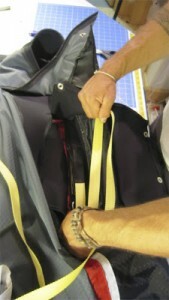 At the same time, tuck the corresponding side of the “paddle” under its triangular capture that is sewn onto the exterior of the harness (see photo). Repeat this process to the other side. 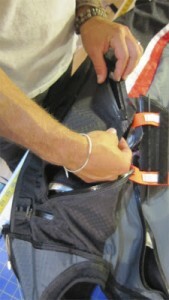 As a last step, if necessary, reach in through the riser slot again (behind your main) and use your fingers to carefully pull all of the excess webbing (orange) from the chute handle to inside the harness so that the paddle can lay completely flat and to allow the paddle to be properly secured with the Velcro on and under the paddle. When you’re satisfied with the installation, pull the strings from the bungy loops to complete the installation. Your chute is now installed properly. 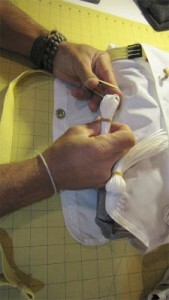 It is helpful to flip the harness over and make sure the bridle is contained in the recessed area. I like to hang in the harness at this point as well. This starts the process of getting the chute to conform around your body and to make sure the quick link isn’t out of position causing discomfort. It’s been my experience that after about 10 hours in the harness, the chute will be nicely conformed to your body shape and increase the overall comfort of the harness. Note: the better your chute is installed, IE; bridle laying nice and flat, chute packed flat and wide to fill out the D-bag, quick link laid to not cause discomfort, the better your Covert will look and fit.